The documentary “Meet the Patels” bills itself as a real-life romantic comedy. It embraces this notion by interspersing its subject’s quest for love with clips from successful examples of the rom-com genre. For this is the story of a man out to find a soulmate, and the film dramatically hinges on the outcome. While his camera-wielding sister films his quest, he is aided and abetted by his parents in scenes that all but guarantee a Hollywood remake. They can even get this film’s subject, actor-director Ravi Patel, to play himself. Ravi’s older sister, Geeta, directs “Meet the Patels” with a tone of mischief recognizable to anyone who has a sibling. You can hear her laughing behind the camera at Ravi’s mistakes, and at one point she calls him an idiot with a mixture of love and disdain. She keeps Ravi’s biggest secret from her parents (but not from us). When he goes off on tangents, Geeta brings him back to the topic at hand. And though very supportive, she never lets him off the hook. She even pulls an older sibling’s “for your own good” move that is the film’s strongest moment: The documentarian in her overrides her brother’s reasonable request to shut the camera off. She shuts it off, but sneakily turns it back on, capturing a moment of high drama. 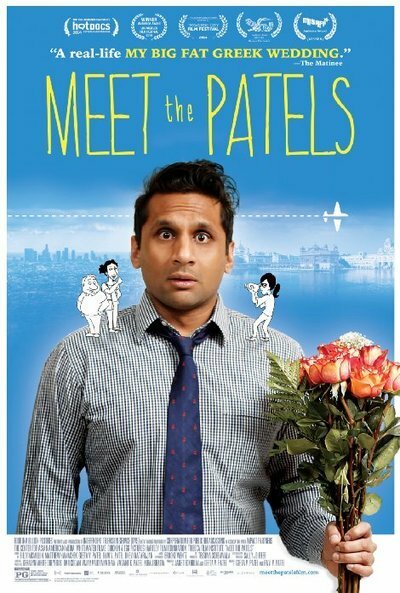 This probably sounds like someone’s home movies—Ravi jokes about this by pointing out the occasionally present boom mike and the shaky framing of some scenes—but “Meet the Patels” is about more than Geeta’s family. It tells a culturally specific story about love and marriage. Additionally, it speaks to the generational struggles over tradition and societal expectations, highlighting that children often have different ideas about life than their parents. These are universal subjects, so one does not have to be of Indian descent to appreciate “Meet the Patels.” You’ll either learn something new or nod your head with amused familiarity. With so much pressure to get married (“after a certain age, a single status becomes a code red,” Ravi warns), one can understand why Mrs. Patel has agita over her lack of grandchildren. When “Meet the Patels” opens, Ravi has just broken up with Audrey, a White woman he has been keeping from his parents for the past two years. It seems like she’s the one, but Ravi knows this relationship is controversial. Feeling the pull toward the expected tradition of marrying an Indian woman, Ravi finally decided to use his Mom’s services. This yearlong, cross-country search takes up most of the film. Mr. Patel tells his son that Mrs. Patel was the twelfth woman his family introduced him to, and their one date before marriage consisted of a chaperoned visit where his future wife said very little. “There was a guy there, so no hanky-panky!” Mr. Patel says of his date. “Things are different now. You can go on multiple dates before deciding.” Ravi goes on date after date, none successful. When Geeta nonchalantly mentions that she’s gone on 200 dates without success, Ravi tells her she should be in front of the camera instead of him. Perhaps for the sequel. Multiple dates may be ok, but some rules haven’t changed. As if finding a mate weren’t difficult enough, for Ravi and Geeta, It is strongly preferred that they find another Patel. If they chose one from India, there is also a geographical restriction regarding where one can find another Patel. I found this section fascinating, especially the sense of fraternity that accompanied one’s last name. If you’re a Patel, any other Patel will welcome you as if you were family, even if your interaction is temporary. There’s a hilarious animated vignette at an American motel where Mr. Patel’s driver’s license becomes a golden ticket for services the motel would never offer regular patrons. If only this fraternity/exclusive club thing worked for me with other Hendersons! But I digress. In today’s Indian culture, the matchmaking game has been upped exponentially. Now there are websites and conferences devoted to getting one betrothed. The technology follows the standard rules for matchmaking. The most fascinating piece of non-technical marketing assistance is the biodata, a sort of personal resume that, like an employment resume, is usually full of bent truths. “I’ve never even seen my biodata!” one talking head reveals. “It creates a rosy picture of you that’s not you,” says another. Now, as a brown person myself, I could not let the notion escape my head that, like my people, Indians have a “paper bag test”. It was a darkly funny revelation that, regardless of race, if you were brown you had to deal with both society at large and your own crew in this regard. “Meet the Patels” sneaks up on you with these mentions and subtle explorations of intraracial and interracial bias, and it does so without destroying the film’s light tone. Like the rom-coms it emulates, the ending of “Meet the Patels” is never in doubt. But this film is about the journey, not the destination. I liked how, during the film, your allegiances change back and forth. Sometimes I agreed with the parents, sometimes with Ravi, and at times I grew irritated with both of them. If there’s a flaw, it’s in how the film presents the women Ravi encounters. There’s a detachment that doesn’t often work. Many times, Ravi comes off as shallow in regard to these women he’s meeting, and the dates all tend to blur together. I also wish I’d known more about his relationship with Audrey; the lack of this information makes the ending feel rushed. Those issues aside, “Meet the Patels” is still a charming, informative and funny documentary.